The Federal agency charged with protecting endangered species under the Endangered Species Act is evaluating a plan to allow a 200-mile wide corridor for wind energy development from Canada to the Gulf of Mexico. The draft land-based guidelines–made ostensibly to avoid, minimize, and compensate for effects to fish, wildlife, and their habitats” — represent one more example of overt and destructive favoritism for an industry that already benefits from fat tax subsidies and mandated market purchases. The plan by U.S. Fish and Wildlife Service (FWS) would allow for killing endangered whooping cranes. The government’s environmental review will consider a permit, sought by 19 energy developers, which would allow constructing turbines (over 300 feet tall) and associated transmission lines on non-federal lands in nine states from Montana to the Texas coast, encroaching on the migratory route of the cranes. The permit from the FWS would allow the projects to “take” an unspecified number of endangered species. Under the Endangered Species Act, “take” is just the euphemism for killing or injuring an endangered species. The government can issue permits to kill or injure listed species with no penalties or risks of lawsuits to developers if they agree to craft conservation plans. 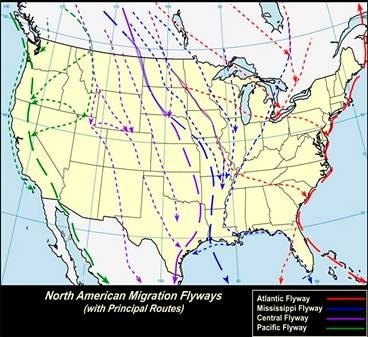 The Administration’s latest wind energy proposal raises concerns because the developments would imperil the habitat of the whooping cranes, including the Central Flyway (shown in purple), a migratory path that cuts through North America, not surprisingly where wind developers want to build, because of prevailing winds. The leading cause of death for the nation’s last historic population of whooping cranes, which stand at 5 feet and have a wingspan of more than 7 feet, is overhead utility lines, the Fish and Wildlife Service has said. FWS Director Dan Ashe said that wind energy is crucial to the nation’s future economic and environmental security, which is why the agency is paving the way for a renewable energy project with an undetermined number of wind turbines generating an unidentified amount of electricity along the 200-mile-wide corridor. How, oh how, will they guess at the number of whooping cranes to be sacrificed. I hope it’s not 280, the estimated number now, after decades of protection and up from an estimated 16 in 1930. “We will do our part to facilitate development of wind energy resources, while ensuring that they are sited and designed in ways that minimize and avoid negative impacts to fish and wildlife,” Ashe said in a statement. I suppose he hasn’t yet learned that wind energy is more expensive and that most turbines are imported and do next to nothing for the nation’s economic future. In fact, they make it worse. I suppose he doesn’t realize that wind energy requires MORE transmission, because of low capacity factors, leading to increased bird collision risk. I also suppose he hasn’t read the numerous studies showing that wind turbines actually cause increases in emissions. I also suppose there’s a really, really good reason USFWS changed their position since last April. Back then, Xcel Energy Inc. decided to scrap a $400 million wind farm project in southeast North Dakota after the Fish and Wildlife Service noted the wind farm’s potential adverse impacts on the whooping crane and piping plover. FWS notified San Diego-based enXco, under contract to develop the project for Xcel, that the project’s 262-foot-tall wind turbines, with blades stretching out 126 feet, could harm whooping cranes, plovers and other migratory bird species, in apparent violation of both the Endangered Species Act and international migratory bird treaties. In Xcel Energy’s filing formalizing the project’s abandonment, vice president David Sparby wrote that FWS’s concerns led to “uncertainty in the cost and timing in mitigating this impact,” which in turn prompted the decision to cancel the project. 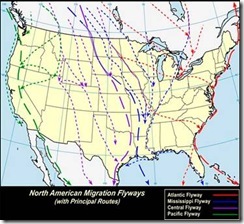 Though exact mortality figures are unknown, FWS calculated in a 2009 report that collisions with wind turbines kill an estimated 440,000 birds a year, including numerous endangered and protected species, and some fear that number will grown substantially as more wind farms are built in remote areas, including key migration corridors. Yet, in the face of daunting numbers, USFWS decided to allow more takings to encourage wind energy? State and Federal wildlife regulators were set to let the areas Golden Eagles go extinct, all in the name of wind energy. It took a court order to finally shut down some of the turbines during the most hazardous times of the year. Whether it is enough to save the Eagle is yet to be seen. The 420 wind turbines now in Pennsylvania killed more than 10,000 bats last year — mostly in the late summer months, according to the state Game Commission. That’s an average of 25 bats per turbine per year, and the Nature Conservancy predicts as many as 2,900 turbines will be set up across the state by 2030. The wind farm mortality is an example of how harnessing renewable energy can lead to negative outcomes. Bat populations go down, bug populations go up. While wind energy is given a pass for killing endangered species, other natural resource users are less lucky. In Wyoming regulators fined a refinery owner $850,000 for violations that killed several dozen birds. The owner of the refinery near Rawlins agreed to a multi-million dollar settlement with state regulators regarding a 2010 incident that killed dozens of birds. Sinclair Wyoming Refinery Co. will pay $850,000 for releasing oil into a wastewater evaporation pond at its refinery, the Wyoming Department of Environmental Quality. Sinclair also agreed to spend $4.5 million on equipment upgrades and training. On April 25, 2010, the company notified state environmental regulators that oil had been released into one of the refinery’s wastewater evaporation ponds. After the release, 80 migratory birds were found dead in the polluted pond, a company spokesman said shortly after the incident. Back in California, because of environmental regulations designed to protect the three-inch long delta smelt, one of America’s premier agricultural regions is suffering in a drought made much worse by federal regulations. The state’s on-going water emergency is thanks to the latest mishandling of the Endangered Species Act. U.S. Fish and Wildlife Service issued a “biological opinion” imposing water reductions on the San Joaquin Valley to safeguard the federally protected delta smelt. As a result, tens of billions of gallons of water from mountains east and north of Sacramento have been denied farmers and just emptied into the ocean, leaving hundreds of thousands of acres of rich farmland scorched and non-productive. The National Marine Fisheries Service also concluded that local salmon and steelhead need to be defended from the valley’s water pumps. The result has already been devastating for the state’s farm economy. In the inland areas affected by the court-ordered water restrictions, the jobless rate has hit 14.3%, with some farming towns like Mendota seeing unemployment numbers near 40%. Food prices nationwide have seen increases as a result of the lack of water delivery. Isn’t it time that the Endangered Species Act is applied uniformly? Given the death of environmental benefits afforded by wind energy, isn’t it time to end the favoritism? Isn’t it time somebody speaks for the whooping crane before it’s too late? I thought that was the job of USFWS–and mainstream environmental groups that find themselves increasingly behind energy technologies that cause core harm to wildlife and nature in general. Thank you for this article. It is a subject that we are trying to put in the public domain and we appreciate anyone that helps to achieve that objective. “Environmental organizations that support wind technology by pretending that the ends justify the means, by falsely assuming that wind can do anything meaningful to alter our existing energy profile, are largely responsible for the depredations unloosed by the wind industry. Their imprimatur gives the industry a legitimacy it does not deserve. This “legitimacy” welcomes the industry’s trade association to a place at the government table, which then compels politicians to bestow upon the wind lobby political favors, given the political penchant for compromise. Bird enthusiasts are covered with the fleas of wind. Knowing that tall structures are one of the leading causes of bird mortality, they expend enormous amounts of energy on siting standards for wind projects policed by pre and post wind construction “studies” that their ranks, for pay, would undertake. Aside from the questionable camp follower ethics of this situation, they distract themselves from confronting the salient issue: Is wind, in the words of FWS’s director, Dan Ashe, “crucial” to the future of the nation’s economic and environmental security? Bird people en masse have steadfastly avoided addressing this question, reverting instead to traditional patterns of habitat protectionism, in the process getting picked off project by project by wind salesmen who counter, all too successfully, with the argument that “some will have to sacrifice if we’re to have the clean, green energy from wind.” Which is Ashe’s rational. Until birders work to understand why wind cannot achieve any of the goals environmental organizations claim for the technology, the kind of cognitive dissonance that this article describes will continue unabated. Until knowledgeable engineers concerned about a better environment and the enhancement of biological diversity get off their duffs and stop pretending that wind has a functional role in a modern power portfolio, windball will continue to be a popular sport in the media and the halls of regulatory agencies. Until knowledgeable think tanks like Cato and Heritage quit playing footsie with renewables and help expose wind as an enormous energy scam, more than our nation’s wildlife will be threatened. If Mr Tanton’s concerns are to be taken seriously, he better not be a cat owner, or work in a tallish building, as together kill orders or magnitude more fowl than wind turbines ever will. Mr. Heslep, if you were to look at the intensity of bird kills on a unit basis you’ll find turbines more lethal. Besides the government doesn’t provide fat tax subsidies nor ESA exemptions to either cat owners or building owners. I actually own six cats (well they own me…) and they have never taken down a bird such as a whooping crane, nor a golden eagle, nor a bald eagle: they generally cower at the sight of the Herons that do frequent my lake though. You cite what by now is a rather hoary wind chestnut about how cats and tall structures kill more birds than wind. Aside from the obvious ten wrongs don’t make a right response, which all adults should harken to, there are other things to say about this ploy. Although it is true that domestic cats are responsible for killing likely hundreds of millions of birds annually, most of that mortality occurs near humans and around cities affecting birds that have a strong population base–viz, house sparrows, rock doves, starlings, red-wind blackbirds. And most tall structures, which, along with the automobile and habitat fragmentation–the other major bird killers–are rather densely bunched in cities and located away from major avian migration routes. Cell towers, an increasing problem for migrating birds, pose some of the problems that wind turbines do, although they are not typically arranged in row after row, with scores or hundreds of towers running for miles along a particular direction, as wind projects do. They also don’t have rotors moving nearly 200 mph at their tips, as wind projects do. In a blinding flash of protective insight, the American Bird Conservancy has sued the feds in the hope of cell tower citing standards that would offer some measure of mitigation. However, the ABC only postures with the wind mess by requesting voluntary siting criteria. Most wind projects, at least in the East, are sited along well known bird migration corridors, offering what I have called a gauntlet of risk for many species of birds (and of course bats), including some with very low overall populations. That you and others attempt to rationalize such cognitive dissonance by such puerile argument is beyond my contempt, particularly on behalf of a “power” technology that couldn’t dent a grape in the scheme of things. Per unit? What possible relevance does per turbine suddenly have? Why not per rotor winding, or blade tip, or cat’s paw? Nature doesn’t care how the figure is normalized, but simply about the total bird population. If we could not be bothered to decry bird deaths prior to the advent of wind turbines, who do you think will be convinced by a sudden pretense about bird deaths now? I’m with you on the issue of wind subsidies. Lets end them, and gain credibility by staying on point. Then by all means attack the subsidies! Mr. Heslep, the per unit matters because of the concept of intensity. Sure, buildings and cats kill more birds (but subject to the notes by Mr. Boone) but that’s beacuse there are so many cats and birds but only a few turbines (too darn many though) and why is the government giving exemptions to ESA to build MORE turbines when each one is so lethal? That’s why ‘per unit’ matters. And if you’ve followed any conservation program over, say, forty years you’d know your comment “sudden pretense about bird deaths now” is ludicrous on its face. It was only people bothered PRIOR to wind tubines that kept the whooping crane, as only one example, from goinfg extinct in the 1930s. Now the government is hell bent to overthrow that prior effort and all for a technology that doesn’t even work. What is new, startling–menacing–about the issue of bird protection in the name of species diversification, habitat conservation, and threatened species is that organizations historically founded and directed for the purpose of such protection–FWS, Audubon, The Sierra Club, ABC, National Wildlife–have abdicated their reason for being by attempting to foist the wind mess over our lands and waters in a misguided attempt to save the world. It’s a bizarro world indeed when such ends-justifies- the- means environmental nutcasery becomes national policy. It is this inanity that Tom Tanton describes. Repeating the concept using different terms that mean the same thing (per unit, intensity) is not really helpful. The issue here with regard to birds it seems to me is twofold, 1) the environmental impact in the aggregate, and/or 2) the threat to a particular threatened species. Concerning 1), consider plane crashes: they might kill (and have killed) 500 people *per plane crash*. Yet plane crash deaths are a tiny fraction of the fatalities incurred by transportation every year, and thus ignoring the other much more common but low ‘intensity’ transpo fatalities while obsessing on aviation accidents would be less than serious. Concerning a particular species ala #2, such as the whooping crane, I think your argument (and article) more persuasive. Again however, let us address the largest threat in that case. Which is? Well we know from the article: overhead power lines (including those to/fro wind farms). If one skips down the list of threats past power lines, the several hundred thousand cell and radio towers, the millions of buildings also on that midwest flyway, just to censure wind turbines, then I conclude the argument is a proxy for a complaint that lies elsewhere. You can think all you want, Mr. Heslep. However for many people like me opposition to wind began a decade ago. I realized a proposed wind project (which I, in my ignorance, initially supported) threatened a lot of birds, although the wind developer’s avian pundit claimed it would be a trifling matter. I was joined in my efforts at the time by Chandler Robbins, perhaps the nation’s leading ornithologist. This was not a johnny-come-lately tactic but an extension of traditional environmental protectionism. I actively protested mountaintop coal extraction practices for the same kinds of reasons. I actively sought wildlands designations with the same basic justification. If I understand your argument, your ire should be directed against FWS and The Sierra Club–the real johnny-come-latelys. For they have changed their spots bigtime in a vainglorious effort to serve wind and not their traditional–and stated–mission–at the expense even of the environmental gold standard, endangered species. As at 2004 the Altamont Pass windfarm, California, had killed over 2,300 golden eagles after 23 years of operation (Dr. S.Smallwood et al, 2006). Not many cats can be so efficient at killing large birds. Cats don’t kill Whooping Cranes either. But wind turbines do, and so do their power lines. Yet the authorities are minded to let thousands of wind turbines and countless kilometers of high tension line across the cranes’ migrating corridor. Appear the wind barons, and nature-protection laws are cynically brushed aside. – Why? The naive among us will reply: it’s to save the planet. But there are other answers, and they are not as pretty. The saddest part is that ornithologists and bird societies, by and large, are looking the other way. Conflict of interest oblige. Banning ‘all subsidies’ to the wind industry will be acceptable so long as all industries are levelized equally. Yes, by all means ban all subsidies for the oil, coal, gas and nuclear industries as well, and require those industries also achieve the same zero emissions level of greenhouse gases and pollutants produced by renewable energy. The hidden support to the nuclear power industry is especially galling, given that a single accident can severely contaminate an area larger than Switzerland (ex: the emergency evacuation zone around Chernobyl, 60 km diameter, which will be in place for many more decades). Response to Jon Boone and others on the dangers posted to birds: improved turbine siting and other operational improvements, such as radar systems which automatically shut down turbines when birds are in close proximity, will continue to lower bird mortality. But making wind turbines out to be insidious bird killers is counter productive, as acid rain and the other pollutants produced by the conventional power plants (not replaced by wind turbines) is responsible for far greater bird losses via habitat destruction and other effects. Sir, the fallacy that renewables (esp. wind) replace fossil generation has been shown to be a false assertion, as has been documented on this blog (see e.g. several postings by Kent Hawins) and elsewhere. I agree that subsidies in general are poor public policy, but according to OMB (for one) the wind industry receives 30 times the subsidy per unit of useful output as other energy sources. Please don’t wave the “infant industry” flag, though, for wind has been favored thus for the four decades I’ve been in the energy policy field. Your comment is not even wrong. Siting guidelines designed to protect wildlife is akin to giving a second story burglary ring a ladder and an alibi. Wind cannot replace fossil fuels; it can only make their machinery less efficient in ways that wholly subvert your rationale for this daffy technology. This is the true “Silent Spring”… but, ABC support the “wind-power bird-smart”… How this work ?! Or better: This work ? …thereby implying that the far-more-numerous power lines conducting electricity from the far-more numerous conventional power plants to end-users magically ARE NOT equally lethal to birds? It is laughable to environmentalists when conventional energy advocates cry crocodile tears…feign concern for small segments of the total environment (which just HAPPEN to pit environmentalists against each other) – while dismissing mega-disasters such as the Exxon Valdez and the Deepwater Horizon as `regrettable events that shouldn’t cause increased scrutiny– or regulation of the oil industry’.